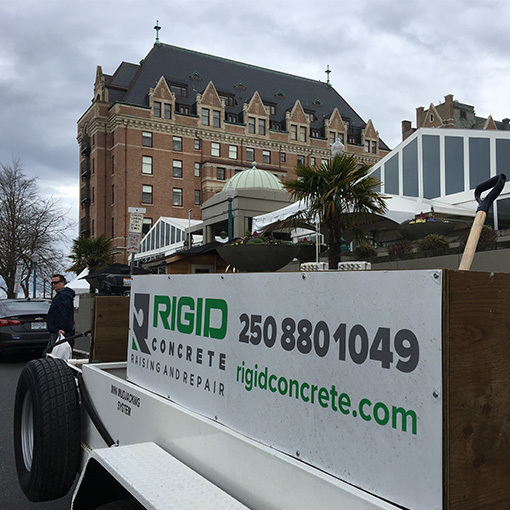 Rigid Concrete Raising and Repair has been helping customers save money with quality concrete repairs on Vancouver Island for over 10 years. We specialize in lifting various areas of sunken or uneven concrete back to grade using a process referred to as slabjacking. This can be done on driveways, sidewalks, patios, basement floors, stairs, pool decks, garage floors and more. 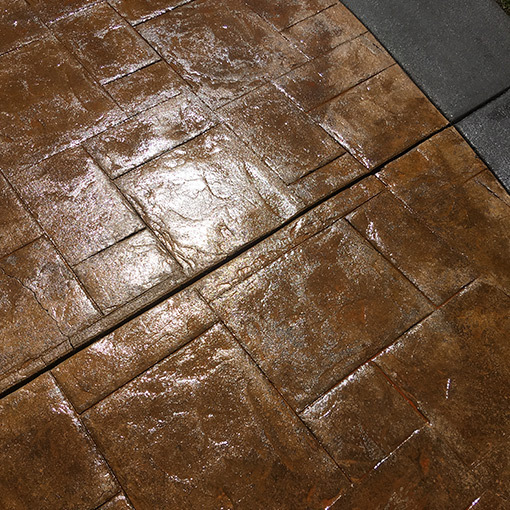 Our crew is also trained in crack repair on exposed aggregate, broom finish and stamped concrete. Having the cracks repaired along with cleaning and sealing will bring your worn out driveway back to its original glory. Residential or commercial concrete leak sealing can be achieved by means of injecting a hydro active grout. Using Rigid Concrete Raising and Repair specially developed equipment, hydro active grout is injected in cracks, joints or other defects in leaking concrete structures. For cracked or damaged concrete in a commercial and industrial environment we have rapid setting repair products that give you maximum durability with virtually no down time. CLICK HERE to see what our clients are saying about Rigid Concrete. Free estimates, quality services, affordable pricing. Call today! Bringing new life to your concrete! We service both Commercial and Residential concrete concerns. From lifting sunken concrete sideways, driveways, patios, void fills or steps, Rigid Concrete Raising and Repair can fix that! Call for your free estimate today! Rigid Concrete Raising and Repair are concrete restoration specialists. We bring life back to your dated and damaged concrete, raise your sunken slabs, repair leaking foundations and virtually eliminate cracks in most concrete. … CALL TODAY! 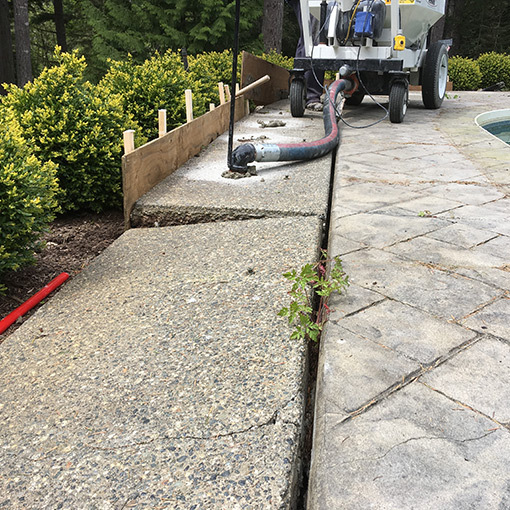 Sunken concrete slabs, sloped sidewalks, uneven pool decks and crooked stairs are just a few areas that Rigid Concrete Raising and Repair can bring back to grade. Slabjacking eliminates trip/fall hazards and saves you money when considering removal and replacing. Call Rigid Concrete Raising and Repair for a free estimate. Rigid Concrete Raising and Repair can bring back the original look of your concrete with a professional cleaning and sealing treatment. Concrete cleaning and sealing prolongs the life of your driveway and looks great! Concrete cracks are repaired using a method that makes them virtually disappear. Rigid Concrete Raising and Repair also replaces and seals control joints. For commercial and industrial customers who can’t afford to have any downtime due to concrete floor issues Rigid Concrete Raising and Repair utilizes rapid setting products that will have the area open to heavy traffic in less than one hour. These repairs leave your floors absolutely even. Cracks, holes or spalls tend to blend in satisfactorily after a period of traffic usage. For leaking cracks, joints or concrete defects in house foundations, pools, parkades, water tanks and decks Rigid Concrete Raising and Repair can seal the crack and permanently stop the water from penetrating. Rigid Concrete Raising and Repair uses the industries top rated material for Hydro Active Grout Injection insuring your leaking concrete will be a thing of the past. Proudly serving Victoria, Duncan, Nanaimo and all points between Vancouver Island and the Gulf Islands.